We are finally here! It looks like we are finally getting some confirmation from Apple. Media invites have been released for October 4th this morning. Apple has surprisingly chosen their own headquarters in Cupertino, California for the keynote. It will be at 10a.m. pacific/noon central so we will be here covering it all as it happens! Now, from my analysis, we may only be seeing 1 iPhone. 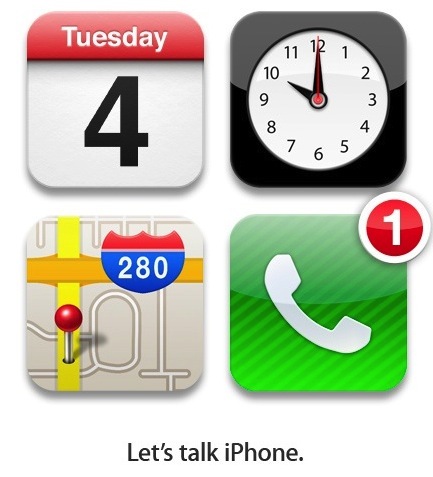 As you can see, the badge on the iPhone icon clearly shows a “1”. If they would have wanted to say that you have “1” invitation, then they would have used a Reminders application or use badged the Calendar. Also, the calendar shows a “4” for October 4th, the clock shows at 10am pacific, and the Maps icon depicts Apple’s headquarters on Google Maps. So there you go guys, we will be convering the keynote live as it happens, so stay tuned! We can put all of these rumors to bed next Tuesday! See you then. I hope the next iPhone works with T-Mobile’s frequency. 3G for sure and maybe their fake 4G network.